^ Morand, Ann; Kevin Smith; Daniel C. Swan; Sarah Erwin (2003). Treasures of Gilcrease: Selections from the Permanent Collection. Tulsa, OK: Gilcrease Museum. ISBN 097256571X. ^ Holmes, Ruth Bradley; Betty Sharp Smith (1976). Beginning Cherokee: Talisgo Galiquogi Dideliquasdodi Tsalagi Digoweli. Norman: University of Oklahoma Press. ISBN 0-8061-1362-6. ^ Fogelson, Raymond D. (1974). "On the Varieties of Indian History: Sequoyah and Traveller Bird". Journal of Ethnic Studies 2. ^ a b c Boudinot, Elias (1832-04-01). “Invention of a new Alphabet”. American Annals of Education. Bender, Margaret. 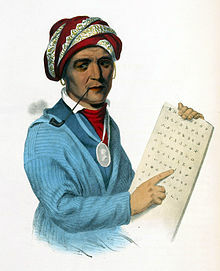 (2002) Signs of Cherokee Culture: Sequoyah's Syllabary in Eastern Cherokee Life. Chapel Hill:University of North Carolina Press. Foreman, Grant, Sequoyah, University of Oklahoma Press, Norman,OK, 1938. McKinney, Thomas and Hall, James, History of the Indian Tribes of North America. (Philadelphia,PA, 1837-1844).